Meet Peanut, the cutest little dog in the world! Mychael and I don’t agree on everything, but we’ve always known that we wanted a dog, or two. But while he wanted a bulldog or a big retriever, I had always wanted a tiny little fluff ball I could cuddle with. For my 37th birthday, a month before our wedding, Mychael let me know he had a present for me that I wouldn’t get until we returned from Mexico. I was intrigued, but was way too caught up in wedding planning to pay much attention. After the wedding I had so much free time on my hands, so I started casually looking at dog shelter listings online. One day I sent Mychael a few to ask what he thought and his response stunned me. He said, “I thought you wanted one more like this,” followed by 10 or so links to cute little fluffy dogs. Turns out, he had been looking for a while, but knew it didn’t make sense to get a puppy and then go to Mexico for a week and a half. I was so excited! We both started looking regularly and after missing out on a few because we weren’t quick enough (tan fluff balls are VERY popular), we were starting to get a bit discouraged. One Monday morning before work I took a quick look online and there was a new posting for the cutest little puppy I had ever seen. I reached out immediately and the woman said she was ours, but we needed to pick her up that same day…in LA! Mychael, being the incredible person that he is, didn’t skip a beat and told me to call my boss because we were driving to LA. When we finally got there and met our adorable little Peanut, it was love at first sight. We knew she was now, and forever would be, a part of our family. We brought her home that day and I think I have loved her more every day since. At the time, she fit in the palm of Mychael’s hands and was about the size of my shoe. The sleepless nights and destroyed shoes are worth it though because what she takes in rest and shoelaces, she gives back ten-fold in love and cuddles. And she made her first furriend in my brother’s dog Honey Bear. She’s the sweetest, most lovable puppy and I don’t know what we did without her. I have more photos than you could ever imagine, so if you want to see more, check out her Instagram page (yep, I’m a crazy dog mom…but at least I recognize and own it 😆). It happened! I met my soul mate, my match. I fell madly, deeply in love. And now I’m a married woman living my happily ever after. On September 22, 2018, in front of our closest family and friends, on a beautiful beach in Mexico, Mychael and I proclaimed our love for each other. It was such a special day, and really an unforgettable week. We decided early on in the wedding planning process that we wanted to do a destination wedding. A couple of years ago, we attended my cousin Ali’s wedding in Tulum and had the most incredible time. It wasn’t about the actual wedding day per say, although that was lovely, it was about all the quality time we got to spend with everyone. We loved so many things about that trip that we decided to do something really similar. Fortunately my cousin is really cool and was flattered, not upset, when I called to ask if we could model our wedding after hers. We worked with an awesome travel agency out of Dallas called Legacy Travel. Our travel agent Lesley was super helpful from the get-go. She made venue recommendations and arranged for us to do a site check trip. We looked at 8 hotels in the Riviera Maya, specifically in Playa Mujeres, Cancun, Puerto Morelos and Playa del Carmen. In the end, we decided on Dreams Riviera Cancun in Puerto Morelos. The hotel was tucked away and felt very private, but was still only a short distance to the airport, which was something we kept in mind for some of our older guests and those that were apprehensius about traveling out of the country. It is an all-inclusive resort, which looks expensive upfront, but when you factor in food and alcohol costs, it’s actually a great deal (especially considering how much our friends and family like to drink 🍻). We worked with their in-house wedding planning staff to put together the event of our dreams (well, really just mine…I don’t think Mychael ever dreamed of his wedding 😆). They do a ton of weddings at this hotel, so I felt really confident in their ability to pull it off. We planned to have our ceremony right on the beach, no shoes required, the cocktail hour on a restaurant rooftop at sunset, and the reception on a deck on the beach. You always hear people complain about wedding planning, but for me, it was really fun. It probably helps that event planning is a part of my job and both my parents are in marketing so they had great advice. I tried hard to think through every little detail to ensure the trip would be a memorable experience for all our guests. Our ultimate goal was to throw an amazing party so people would have a great time celebrating and getting to know each other. My parents spoiled us and upgraded everything about our trip, so we were picked up by a car service and taken to the airport. Then hung at the lounge and flew first class. When we changed planes in LA, they surprised us by booking the seats right across from us (we didn’t think they were coming until the next day!). I love surprises so much and it was so fun to travel with them to Cancun. Once we got to the hotel, everything went by so quickly. The first couple of days were filled with wedding-related meetings to make sure everything was ready to go. And then before you know it, the wedding activities began! We had a welcome karaoke party so everyone could get to know each other over a few (or 10 drinks). The following night was the rehearsal dinner. It was a beautiful private dinner that felt like we were eating in the jungle. Following dinner, we had a surprise fire dancer show. It was pretty cool! And before you know it, it was the BIG DAY! My amazing maid-of-honor Anita got some super-cute matching bathing suits for the bridesmaids and my girls and I did a fun photoshoot that morning. And then it was time to head to the spa to get ready. I invited the bridesmaids, flower girl, the moms and Mychael’s sister to all get ready together, so we completely took over the spa. It was so fun! Then, we went back to my room to all get dressed, hang out and toast with some champagne. And I found the sweetest card from Mychael. He’s not a mushy guy, so this meant so much to me. It talked about how people kept asking if he was nervous, but he wasn’t. He was sure. It resonated because I felt the exact same way. I wasn’t nervous about marrying him or spending the rest of my life with him. I was excited. This was the moment I’d been waiting for and I had found the man of my dreams. It all came and went in a flash. Family is really important to both Mychael and I so our ceremony consisted of only family members. My dad was our officiant (and he nailed it…funny and sentimental at the same time), Mychael’s dad did a special Irish bell ringing ceremony to honor their family’s heritage, his sister did a sweet reading about love and my brother did a more light-hearted reading from The Wedding Singer. Our ceremony was heart-felt and there were some candid moments that I will treasure forever. It was perfect. Everything I had ever imagined and so much more. From there we took a million photos (Mychael’s personal nightmare) and our guests headed to the cocktail hour. During the cocktail hour it started pouring. We knew this was coming and had planned earlier in the day to move the reception inside. Ideally it would have held off another 30 minutes, but the staff was really on top of it and moved everyone downstairs inside the restaurant just in time to avoid the rain and finish up the cocktail hour. It wasn’t my dream to have the reception in a ballroom, but in the end it wasn’t a big deal. Everyone had a great time and some people even said they liked it better because there was air conditioning. And the staff did a great job of making it look beautiful. This is a goal that I wasn’t sure was even possible. I have never updated my driver’s license and thus it’s set at the weight I was in high school….a time when you can eat whatever you want and not gain a pound. After getting engaged at the end of September 2017, I knew I wanted to lose some weight and get toned for the wedding. The dreary San Francisco weather had gotten me accustomed to comfort food and cozy sweaters. And once we decided on a destination wedding (read: spending time with all our friends and family in a bikini 👙) I was dead set on getting abs. So at the start of the year, I set a wedding resolution, not a New Year’s resolution because statistically those don’t typically work, to get into shape. My whole life I have never really cared about weight per say. The numbers on the scale can make you feel really bad about yourself when you actually look great. And we all know that muscle weighs more than fat, so if you’re strong, your weight won’t necessarily be as low as you might like. All that aside though, I had set this goal on my list and I figured this was the most likely time to check it off. I made sure to keep my ultimate goal in mind though because while it would be great to accomplish the weight loss, I wanted to be strong, not skinny. Generally, I’m a pretty motivated person. If I set an absolute like, “I’m not eating any sweets,” I’m pretty good at sticking to it. I know myself well enough to know that I need these absolutes in the beginning to get myself on the right track. So that’s where I started…no sweets and cook dinner at home at least three times per week. (Thankfully I live with a very talented chef, so the cooking part wasn’t as challenging as it could have been.) Then we added in a couple of other things like making our own pizzas on a healthy crust instead of eating out and, probably the most difficult one for me, limiting tortilla chips (my fav!). I also started bumping up my workout routine, but I approached it in a different way than I had in the past. I tried everything and never did the same thing in one week. I did Pilates, yoga, Mychael’s Fit Phases program, Barry’s Bootcamp, Orangetheory, Body by Simone, circuit workouts in Mychael’s gym, running, swimming, spinning, dance classes…you name it. It was really fun switching things up so much and trying new things. I planned my workouts for the week on Sunday, but kept things flexible and just did whatever I was feeling that day. The food part is much more difficult for me in general. If I could work out twice per day and live on pizza and tortilla chips, I’d be in heaven. Unfortunately though, that’s not the way it works. So I started food logging. It was surprising to see how many calories were in some of my favorite foods. After logging all the separate ingredients in one of my go-to take-out salads, I might as well have just had pizza. It was very eye opening and forced me to make some additional changes to my diet. I started everyday with an Herbalife cookies ‘n creme shake (delicious, healthy and full of vitamins). Mychael is a rep so I knew about the products, but hadn’t used them regularly before. Then for lunch, I started going to the grocery store near my office and buying all the ingredients to make my own salads so I could ensure there weren’t any hidden calories. For dinner, Mychael made lots of delicious dishes that always consisted of a lean protein and veggies. I actually started logging everything in the Fitbit app. I pretty much lived by it. (Full disclosure, I work at Fitbit, but aside from having access to Fitbit trackers, there really isn’t any advantage there.) I made sure to drink at least 100 ounces of water per day; tried REALLY hard to get at least 7 hours of sleep each night; almost always got my 10,000 daily steps; and kept track of my exercise. This was all gradual though. I didn’t just jump right into all these big changes, but worked my way up to hitting all these goals. By food logging in the app and using the connected scale (Fitbit Aria 2), I was able to make sure I was staying at a calorie deficit. That’s not to say I didn’t have cheat days. I allowed myself to indulge on special occasions…I had Susie Cakes at my bridal shower, margaritas at my bachelorette, Mexican food on my birthday, etc. I didn’t take anything to a crazy extreme and allowed myself to take a break, but then jumped right back into my healthy habits afterwards. Overall I did more good than bad. By giving myself plenty of time to reach my goal, I had room for cheat days, which is a much more realistic and sustainable way to approach weight loss and fitness. I weighed myself every Friday morning for consistency and started to see the numbers slowly go down. And on Friday, September 14, I hit my goal! 120 pounds! Scale image is from Friday, Sept. 14. I weighed myself again on the 17th and it went down a little bit, but I didn’t have my phone handy to get another pic, hence the slight discrepancy. So, I’m sorry to say that there’s no trick, no secret pill, no special diet that got me here. The “trick” is everything you already know – move every day, don’t eat crap, drink water and get sleep. And while it took some time to adjust, now it’s just a new lifestyle…one that is sustainable and not a crash wedding diet. I’m really proud of all the work I put in and the progress I made. Mexico here I come! Being in a relationship means you have to make some compromises, and this becomes very apparent during the holidays. When I was single, I went home for every major holiday, but now with Mychael in the picture, he wants to spend some of them with his family as well…imagine that! So now it’s a trade-off and we spent Christmas 2017 in Indiana. We had a great time with his daughter and parents, and we even got some snow, which you don’t see in Sacramento. Mychael, being the money-conscious adventurer he is, typically drives home for the holidays. He saves tons of money on flights and gets to stop and see new things on his way to Indiana. I’m usually more of a “let’s just get there” sort of girl, so I typically fly, but this last year my curiosity got to me and I decided to join Mychael for an epic road trip from Indiana to California. I’d always loved the idea of a road trip, but that just wasn’t the way my family typically travelled. Fortunately, I had a pro taking me out on the road for this adventure. The first day we drove and drove and drove. Most of the places we wanted to stop were a little further along the route, so we tried to knock out as many miles as possible that first day. We did make one pretty awesome stop at the largest truck stop in the world. It was actually impressive….they had everything, a doctor, a food court, and even a big rig INSIDE the building. That day we made it all the way to Lincoln, Nebraska, but arrived in the middle of a snowstorm. We were driving at the same speed I run so we decided to call it a night and stay there. We found a cute restaurant for dinner and a nice little motel and once we weren’t driving in it we could appreciate how pretty the snow was. The next day we got up early and hit the road for Wyoming. Neither of us had spent much time there, so we weren’t really sure what to expect. We didn’t have time to go north to Jackson, so we ended up at the Terry Bison Ranch in Cheyenne. This place was so interesting. It felt a bit like a dude ranch mixed with a zoo of exotic animals. Not only did they have bison, but they also had camels, emus, lamas and ostriches, among other things. We rode a stuffed buffalo and jackalope, posed for photos in front of the western façade, met some animals and got some sweet t-shirts. We even saw a wedding. It was such a unique, fun stop. Following that, we got back on the road and spent the night just outside Salt Lake City, Utah. The next morning we were on a mission to find hot springs. Mychael is a hot springs expert so he already had one all planned out for us – Fifth Water Hot Springs. We could drive to the parking lot outside the hiking trail, hike two miles and get to a really beautiful springs. Well, when we arrived, part of the road was closed due to the snow, but we just went for it anyway…ended up being a six-mile hike each way. We didn’t really have the right shoes for such a long snow hike, and Mychael was of course in shorts, but we made it work. And man, was it worth it. The hot springs were incredible. They were bright teal and turquoise and looked almost fake against the bright white snow. There were a surprising amount of people up there too, given how far the hike was. But hey, we all got our exercise for the day. We hung out for a while and made some new friends, then decided to make the trek back. Following that, we had to make up some time so we did another long afternoon of driving to Nevada. That night we stayed at the scariest hotel I’ve ever been to in Wells. To be fair, it’s a really small town and there just aren’t a lot of options, but this was a run-down hotel that I’m pretty sure was used in a horror movie. We were so tired though that we just didn’t think about it and went to sleep. The next morning we drove just out of town to the 12-Mile Hot Springs. This place was so cool that it was worth the creepy hotel stay. We drove down a deserted road, past a ghost town, out into the middle of nowhere. At one point the road got so bad that we couldn’t drive anymore, so we parked our car just randomly in the middle of a field and covered the rest on foot (Mychael, still in shorts of course). The hike was nothing compared to the other day and when we got to the hot spring, there were only two people there who were leaving. This one was so different than what we had seen the day prior. It was in beautiful valley with nothing else around. We ended up having the springs all to ourselves for quite a while until we decided to get back on the road. From there, we wrapped up our trip with a stop by my parents’ house in Sacramento to celebrate my dad’s birthday/New Year’s Eve. We had the best time on our road trip. Even the time we spent just driving in the car was a blast. Together, we have so much fun no matter what we’re doing. And I’m sold on this road trip thing. Can’t wait for the next one! What?!? When I was 30 and first started writing this blog, one of the items was to run a 10K, so it’s pretty incredible that in a matter of 6 years, that goal has turned into a standard weekday morning occurrence. Now I can proudly say that I’ve done two half-Ironman races and run two marathons. Running a marathon was never a goal of mine. It seemed pretty silly. Why would anyone want to run for 4ish hours? Half-marathon, no problem, but the full distance just seemed ridiculous. That was until we decided to sponsor the 2016 New York City Marathon, the biggest and one of the most well-known marathons in the world. My colleague Reed said that we needed to run it because it is a “bucket-list race.” Wasn’t on my bucket list. Somehow though she convinced me this was a once-in-a-lifetime experience that I shouldn’t pass up. So, I signed up. I looked online for a training plan that wouldn’t be too aggressive, but would get me to the finish line in one piece. 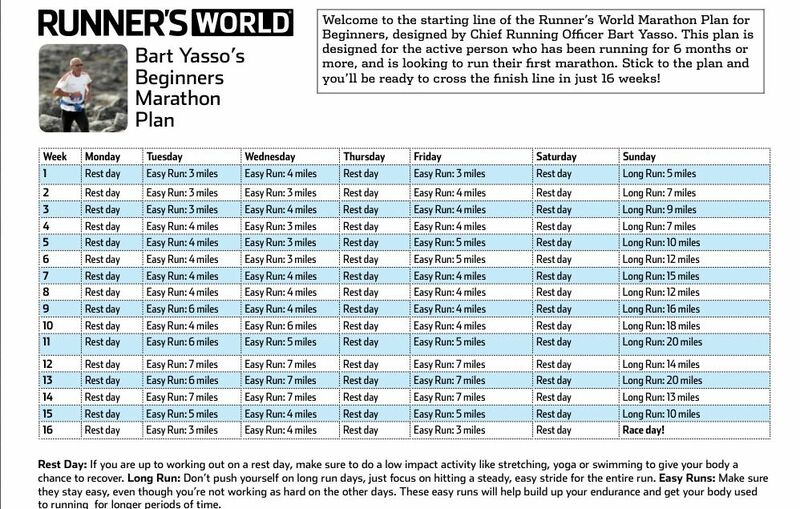 I found a beginner plan from Bart Yasso, former Runner’s World writer known as the “Mayor of Running.” I followed the plan religiously, not missing a day. Physically I was ready to take on New York, but mentally was another story. I’m just a little bit Type-A (insert sarcasm here), so I did so much research and studying going into the race that I think I psyched myself out. My recommendation for anyone looking to run their first marathon is to be prepared, but don’t overdo it. In the final days before the race, I was a ball of nerves, but SO excited! And I had my coach in town to go on one last training run. When race day came, my goal was just to finish, that’s it. No lofty time goal. Just survive this thing. The time went by fast and before you knew it, we were off. I kept a steady pace and made my way through the 5 boroughs and 26.2 miles. The crowd along the route was incredible. There were people along almost every inch. It was so inspiring. And best of all, I knew some of them! My mom, dad and Mychael jumped around the course to cheer me on at different points (thank goodness Mychael is an NYC subway expert navigator). My cousin’s even came out to cheer me on in Brooklyn and the Bronx. The signs my friends and family made were amazing and looking for them along the course was a great distraction. I’m so lucky to have such incredible support. And I DID IT! I finished the race in 4:30:42. I enjoyed the experience so much that I ran the race again in 2017. I followed a much more aggressive plan from Very Well to try and improve my time, now that I knew I could do it. I was on track to shave at least 15 minutes off my time from the year before. And as an added bonus, Mychael decided to run with me this year (I think he was having a bit of FOMO after how much fun I had the year before 😜). Unfortunately, we both got sick in the weeks leading up to the race and our training was thrown off track. When race day came we were still under the weather, but decided to just go for it any way. We altered our goal from getting a PR (personal record) to just having fun. We had a bigger Fitbit crew to hang out with before the race. 2017 was MUCH colder than the previous year, but we had great outfits to keep warm at the start. We stopped in mile 1 to take a selfie on the Verrazano Bridge. Mychael stopped again around the 10-mile point to take a bourbon shot with this supportive fan. We stopped to take pics with our friend Jessica just past the halfway point. Needless to say, we were taking our time. But we did it. Between the weather (Mychael took off his shirt and rung it out at one point) and being sick, we were happy just to finish. Even though we were forced to change our goal, we had a lot of fun running together and it was a different experience this year to take the time to enjoy all the different sights and sounds of each borough. I don’t know if I’ll ever run New York again, but these experiences have awoken a new love for running. Chicago 2019, here I come! I’m big on surprises. I’m not sure who enjoys them more, the person planning the surprise or the person being surprised. It’s fun for everyone! For Mychael’s 39th birthday I wanted to do something fun; something he would never think of, but would never forget. Mychael is really outdoorsy and he’s slowly converting me, but I’ve always been more of a hotel & spa day sort of girl. It was his day though, so I tried to come up with something that was more up his alley. I remembered hearing about these cool yurts in Big Sur, so I started doing some research and found that the Treebones Resort had yurts, but also a really unique treehouse. It was the perfect once-in-a-lifetime surprise I was looking for! Fortunately I’m a crazy planner because this place books up FAST! I booked in February for our stay in September and was lucky to secure Mychael’s birthday weekend in the treehouse. On Friday of his birthday weekend we started our journey down to Big Sur, making a stop at an amazing restaurant called Nepenthe. The restaurant has been open for 69 years and sits perched on a cliff, providing a picturesque ocean backdrop for lunch and the perfect start to our weekend. Following lunch, we continued down the road to Treebones. The resort is comprised of a bunch of campsites, some yurts, the treehouse and the nest, a very appropriately named human-sized bird’s nest, as well as two restaurants. We checked in and immediately went to check out our sweet weekend home, situated at the edge of the resort with breathtaking views. We crossed the suspension bridge and settled into the treehouse. We spent the weekend relaxing, checking out the elephant seals in San Simeon, kayaking, walking down the beach, hiking to waterfalls and taking tons of pictures. We had the best time relaxing and spending time together. It was the perfect weekend birthday celebration. If you ever have the opportunity to stay in a treehouse, I highly recommend it! Yeah, that’s right…I think this officially makes me a grown-up. On March 23, 2017, we bought a house! Now, when I first put this on the list I figured I’d be buying a house in LA on my own, hence the “condo/” addition. But, like I said, I’ve been working on #39, so now I have a partner in all these important life moments. When we made the big move from Santa Monica to San Francisco in March 2015, we looked to rent an apartment/condo similarly sized to our place in LA. We had an amazing thing going in Santa Monica – 3 bedroom, 2 bath, walking distance to the beach – so we knew it wouldn’t be quite the same, but we had no idea what we were in for up in the Bay Area. We ended up finding a 2 bedroom, 1 bath in the outskirts of the city for 150% what we were paying in LA. We were optimistic and we were still walking/riding distance to the beach, but we had to trade in our bathing suits for sweatshirts. We quickly came to learn though that the city wasn’t the place for us. The weather was just such a downer. In spring 2016, we came to the realization that for the amount we were paying to rent a condo in the city, we could buy a house in the East Bay. So in July we started casually looking. We weren’t really ready to buy, but we wanted to see what was out there and what we could realistically afford. We looked at houses in “up-and-coming” areas of Oakland, but it didn’t exactly feel safe and some of the spaces were…creative. We looked at a “fixer-upper” in Piedmont and after that decided to add walls and floors to our checklist. We kept casually looking for a couple of months and then had one lucky weekend where we found not one, but two houses we loved! That was a Saturday. By Tuesday we had a real estate agent, a mortgage broker, we were pre-approved for a loan and we put in an offer. Everything happened SO fast! We’re almost ready to have people over, so get ready for the housewarming/1-year anniversary party, coming soon! 1. Go skydiving – DONE! 4. Run a 10K – DONE! 11. Go horseback riding by the Hollywood sign – DONE! 16. See a Broadway show – DONE! 18. Weigh the weight listed on my driver’s license – DONE! 19. Go to the Magic Castle – DONE! 22. Buy a new car – DONE! 26. Walk across the Golden Gate Bridge – DONE! 27. Buy a condo/house – DONE! 28. Watch a futbol game in Spain – DONE! 34. Get an adorable little dog – DONE! 38. Take an epic road trip – DONE! 39. Find my soul mate, fall in love and get married – DONE!